International Journal of Research in Health Sciences,2014,2,1,133-139. 1Associate Professor (Microbiology), ESIC- Medical College, PGIMSR, K K nagar, Chennai-78, Tamil Nadu, INDIA. 2Consultant (NRHM, Department of Public Health) Arogya Bhavan,Mumbai-01, MH, INDIA. 3Professor (Community Medicine), Ashwini Medical College Hospital, Solapur, MH, INDIA. 4Assistant Professor (Microbiology), Dr. Vasantrao Pawar Med College, Nashik-3, MH, INDIA. 5Associate Professor (Microbiology), Dr. Vasantrao Pawar Med College, Nashik-3, MH, INDIA. Background: Intestinal parasitic infections (IPIs) are endemic worldwide and have been described as one of the major cause of illness and disease. The prevalence of different parasitic infections depends on various social, economical and environmental factors. Therefore the study aimed to estimate prevalence and identify factors associated with intestinal parasitic infections among 1-5 years old children residing in tribal area of Maharashtra. Materials and Methods: A cross-sectional study was conducted from June 2012 to Nov 2012. A simple random sample of 385 children aged 1-5 years was collected. The study used pre-tested self-administered questionnaire based on demographic, domestic and peri-domestic factors. For each enrolled child in the study, a standard stool ova and parasite test with formal-ether concentration technique was done for the assessment of the outcome. Results: Out of 385 children examined, 145 (37.66%) were found positive for various intestinal parasitic infections. The highest frequency of 32.41% was noted for Giardia lamblia followed by Entamoeba histolytica (21.37%). Variables like No. of children in a family under-five years of age, low maternal education, self-latrine care, lack of solid waste collection and visible sewage near the house are found to be significant risk factors for IPIs. 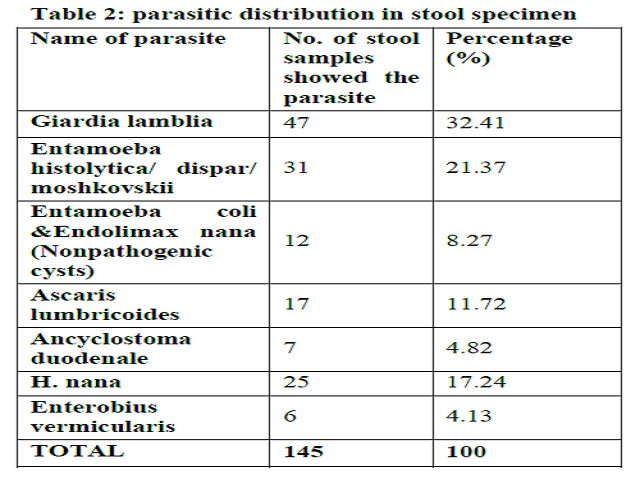 Conclusion: The frequency of intestinal parasite infections was found to be high among pre-school children (under five years) residing in tribal area. Major contributory factors included social, domestic as well as peridomestic factors related with poverty, hygiene and education. There is need for campaigns to create awareness about health and hygiene among parents.